This was my answer to a brief asking us to create a fitness-themed app that included a media player. 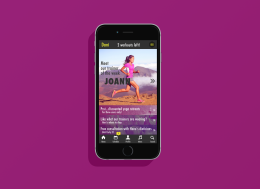 Hone allows clients to subscribe to a personal trainer who then sends the client a weekly schedule of workout videos. I matched bold colors with modern typography to attract a young and trendy audience who are dedicated to staying fit, but may not have the time.